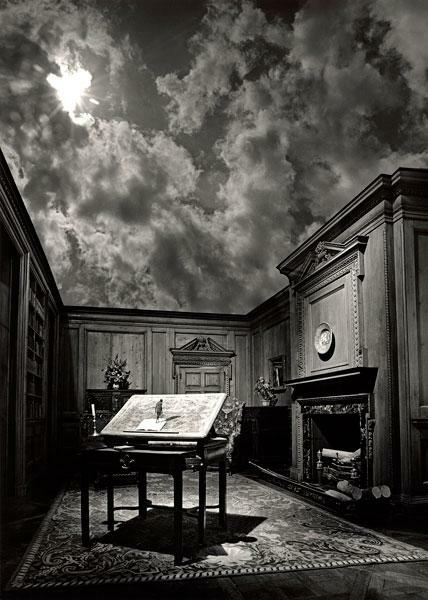 Todd Behrens views Jerry Uelsmann's "Untitled"
Jerry Uelsmann is a master of the darkroom who, before the creation of image editing software, saw the possibilities of combining photographic images from separate exposures into a single, seamless composition. Because of his deftness, when we look at his images from a context where digital editing is expected, we still feel a sense of awe and wonder. Which is why he remains one of the most influential artists working with photography even though that particular genre of art has evolved dramatically since Uelsmann began exposing film to light. Uelsmann's Untitled is a part of the the Sioux City Art Center's permanent collection and can be seen now in the Permanent Collection on View exhibition. We were standing atop a miniature mountain, looking out over the Big Sioux River from a statuesque bluff not all that far from the confluence of the Missouri and the Big Sioux, over the prairie land of Broken Kettle Grasslands Preserve, 3000 acres of sheer beauty. No one else was there. It's a way to paint something as it really looks, but it's not what your conscious brain is really telling you it should look like, because there shouldn't be all these colors. Todd Behrens, Curator at the Sioux City Art Center, begins our series exploring art with a still life that reveals an odd gap existing between what we think we see and what we really see. In Julie Blackmon's Crystal Ball, the uncanny representation or reality reveals deep truths about parenthood. The Sioux City Art Center's Todd Behrens takes us into this photograph where expectations become a medium for building understanding. Join us every Wednesday morning as we explore the collection of the Sioux City Art Center. "The best way of approaching every experience that you have on a daily basis is with a freshness, with an openness, and to try to make sense of what is in front of you, rather than bringing all or your preconceptions to something," says Todd Behrens, curator at the Sioux City Art Center while looking at DELL (ray), a work by James Shrosbree, a painting that welcomes its viewers by first rejecting their past experiences. "The light that Paul makes us feel... gives us that sense that [Martin Luther King, Jr.] is both coming forward and going back at the same time," says Behrens. "What he creates is something so unexpected." As you look deeply into this familiar image, you find that what you see is more illusive and that there are shapes and ideas within that don't conform to one's understanding. Martin Luther King, Jr. is on display in the Sioux City Art Center's Permanent Collection On View exhibition.